A University of Texas at Arlington researcher is working to determine which gene expressions affect the development of which parts of the heart in an effort to determine how genes might be used to heal heart tissue damaged by heart attacks. Juhyun Lee, an assistant professor in the Bioengineering Department, has been awarded a prestigious Career Development Award by the American Heart Association for the research. The three-year, $251,000 grant relates to another grant that he received in March to develop a new microscope that can capture 3-D motion, then add time to construct a 4-D beating heart using optical imaging techniques with fluorescent nanoparticles in a zebrafish. )can lead to defects with high mortality rates. Lee will use the new grant to explore targeted delivery of messenger RNA, or mRNA, to reverse damage caused by congenital heart disease by modulating the mechanical forces to reduce gene expressions. Then, he will use nanoparticles to encapsulate the mRNA and deliver it to the heart. Once the mRNA is introduced, he will recover the gene expression to see if trabeculation occurs even in the absence of mechanical forces. Messenger RNA conveys genetic information from DNA to the ribosome, where they specify the amino acid sequence of the protein products of gene expression. If it's the same as low blood flow, I'd cut contractility. )or low blood flow, but if we can control the gene expression that leads to cardiac development we could eventually repair congenital heart defects and other damage to the heart." Part of the research will include using the microscope that he developed to integrate multi-view fusion to enhance the quality of the image. Multi-view fusion involves taking photos around an object 45 degrees apart, then using a computer to fuse the photos together to increase quality by eliminating dark areas of the photos affected by the scattering of light in the object. Lee's work is the latest example of UTA's research in cardiac health in support of health and the human condition, a key tenet of the University's Strategic Plan 2020: Bold Solutions | Global Impact, said Michael Cho, professor and Alfred R. and Janet H. Potvin Endowed Chair of the Bioengineering Department. "I am delighted that Dr. Lee has received this prestigious grant so early in his career. 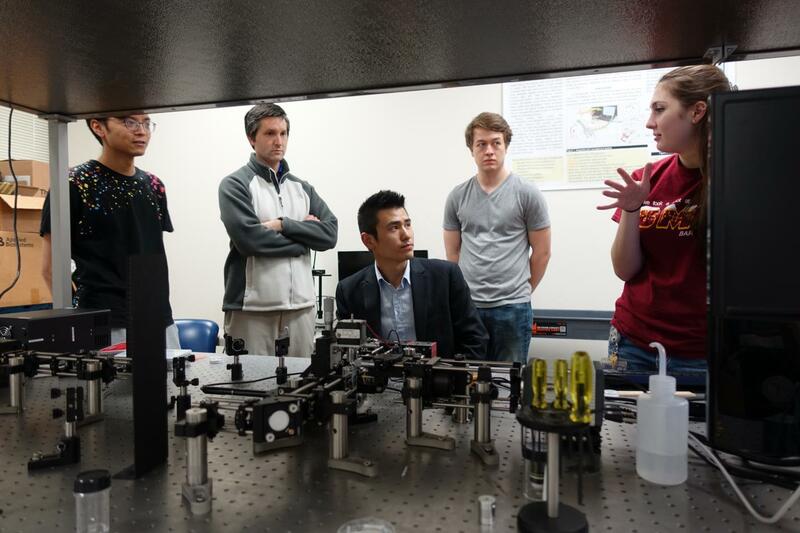 His achievements in his first year as an assistant professor are outstanding," Cho said. "This new grant, coupled with his current grant, will provide critical insight into how gene expressions can be used to jump-start heart growth or healing. Promising discoveries could lead to major advances in how heart defects and damage from congenital heart disease are treated." Michael Nelson, assistant professor of kinesiology, is using a $3.3 million grant from the National Institutes of Health to study the link between fat storage in the heart and cardiovascular disease, as well as the influence of gender on the development of cardiac dysfunction. Bioengineering Professor Kytai Nguyen earned a National Institutes of Health T-32 grant totaling more than $1 million over five years to recruit and train outstanding doctoral students in nanotechnology and nanomedicine related to cardiovascular and pulmonary issues. Mark Haykowsky, a cardiovascular exercise scientist in the College of Nursing and Health Innovation, received a $308,000 grant from the National Institutes of Health to study exercise intolerance in older heart failure patients with preserved ejection fraction, or HFpEF. Yi Hong, an assistant professor in the Bioengineering Department, was awarded a $211,000 R21 grant from the National Institutes of Health to develop materials that will allow doctors to use a 3-D printer to create unique new blood vessels for children with vascular defects.